Living near Lisbon, Cascais and Sintra and being able to enjoy the quality of life in a golf resort, where green spaces and tranquility of the countryside provide an enviable quality of life, is the right option for you! Come to know this luxury villa uni-familiar T6, with unobstructed views, in Oeiras Golf & Residence. With a privileged location in Tagus Village, next to Tagus Park, you will find this dream house in triplex, T5 villa. The Tagus Village development, integrates a modern architectural concept, with an excellent construction area, large open spaces, interior space, natural light and quality finishes. Luminous detached villa in Barcarena, with 9 rooms and swimming pool, where the spaciousness of the areas, the view, comfort and privacy prevail. Basement in open space with 94 m2 and natural light. Living near Lisbon, Cascais and Sintra and being able to enjoy the quality of life in a golf development, where green spaces and the tranquility of the countryside provide an enviable quality of life, is the right option for you! Here you find this luxury detached villa T5 + 1, with space to host a large family, in the Oeiras Golf & Residence development. Detached 4 bedroom townhouse with contemporary architecture in Oeiras Golf Residence, in Oeiras. Excellent villa with 438m2, very well located, in Galiza, Estoril, 500 meters from the roundabout to access the A5, close to schools, shopping centers, golf course, tennis courts, swimming pools and beach. In Barcarena, in a village of Oeiras whose historical scrolls and location attract those who dream of living near Lisbon, Sintra and Cascais, but at the same time want to live in a quiet place, you will find ... This townhouse, of type T4, located next to Oeiras Golf & Residence. Spectacular villa with a modern and luxurious design and architecture in the shape of an "L", oriented South-West with excellent views to the open sea and countryside. You are still not at home? Imagine a condominium of excellence in a privileged area, built thinking of you ... Dream apartment T3, with a total area of ​​223m2, contemporary and exclusive design, two steps from Lisbon. In one of the most prestigious condominiums on the Cascais line - the Condomínio Riviera - is this fabulous 3 bedroom apartment with 189m2 and unobstructed views. This fully renovated and enlarged Penthouse Duplex T4 in Penha de França is an excellent opportunity for those who wish to live in the city of Lisbon. The apartment, as new, with excellent areas and a terrace with unobstructed views to Penha de França and the river, it's an opportunity not to be missed. New 2 bedroom apartment on the top of Algés, with an excellent sun exposure, in a quiet area with the convenience of access to all kinds of services, 5 minutes from the center of Algés. Living in the center of Oeiras, next to Poetas Park and the sea, in a gated community, is an opportunity not to be missed! Come to know this nice 2 bedroom apartment, with good areas, renovated and in excellent condition. Apartment T1 New, with an excellent sun exposure, in a quiet area with the convenience of access to all kinds of services, 5 minutes from the center of Algés. In Lisbon, near Military College, in Estrada da Luz you find this apartment T2 +1, refurbished and with excellent location. For those who work in Lisbon this is an excellent opportunity to purchase a renovated home at reasonable prices. Bright 1 bedroom apartment, located in a premium area and with excellent accessibility, the Oeiras Living Forum. Ideal for single buyer or young family. 2 bedroom apartment with unique identity and river view next to "Graça" neighborhood. Located in one of the most noble areas of Lisbon, next to Príncipe Real in a Gated Community, you will find this 1 bedroom apartment for sale. This is an excellent investment for those looking for a house to live or rent, next to one of the most dynamic districts of Lisbon. In Lisbon, in Avenidas Novas and next to Praça de Espanha, you will find this building in ruins, with approved construction project and license ready to pay . This is an excellent investment considering the estimated value for the entire area adjacent to the Praça de Espanha. In one of the most sought after luxury developments in the vicinity of Lisbon, Quinta do Cerrado, finds this lot of land for sale, where you can build the house of your dreams. In one of the most sought-after municipalities in the vicinity of Lisbon, Oeiras, in prime area of ​​Paço de Arcos, where you can build the villa T4 + 1 of your dreams. Plot of land with excellent location, privacy and golf view at Oeiras Golf & Residence. This is a unique opportunity to build the house that you have always wanted, in one of the most sought after developments in Oeiras. Find the perfect place for your dream home at Oeiras Golf & Residence. A place close to everything, surrounded by nature and with excellent access and wide green spaces. Excellent Commercial Space, in prestigious condominium, with storefront and area of ​​158 m2. 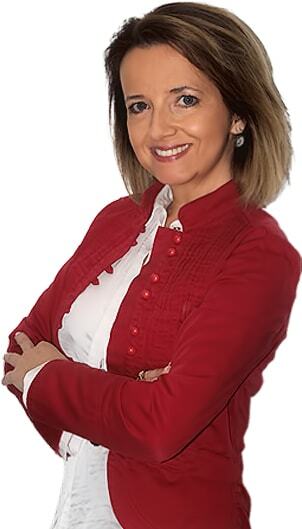 My name is Ana Mação, and for me to be a real estate consultant has always been a challenge and a vocation. My clients deserve more than mailing in the mail, a sign on the window or a visit from time to time. They deserve a dedicated consultant, ensuring that their property sells quickly and for the best value. For me, who started activity in the real estate business, 3 years ago, being the first of 1650 real estate consultants at Keller Williams Portugal is indeed a reason for pride and gratification. What is the secret? I have a network of national and international partnerships and contacts and I invest a lot in Digital Marketing and Advertising. On top of this, commitment, work, hard work and more work still ...! The numbers speak by themselves! When we work with competence, dedication and honesty, customers reward and repay our work. These are some indicators referring to the last 12 months of my work. How to you set the selling price? Excelente profissional! Muito obrigada Ana pelo seu trabalho feito com tanta atenção e simpatia! Excellent professional! Thank you so much Ana for your work, done with such attention and sympathy! Excellent professionnel! Merci beaucoup Ana pour votre travail accompli avec une telle attention et sympathie! Deixo aqui o meu apreço pela eficácia rapidez e simpatia! Grata Ana Mação pela venda rápida com que foi feita a venda do meu apartamento! Um mês e já está vendido! Top! I leave here my appreciation for the speediness and friendliness! Thank you Ana Mação for the quick sale with which my apartment was sold! One month and already sold! Top! Je laisse ici mon appréciation pour la rapidité et la convivialité! Merci Ana Mação pour la vente rapide avec laquelle mon appartement a été vendu! Un mois et déjà vendu! Top! Still not found the house of your dreams? Contact-me! I have more properties to sell!